Printers are so integrated into our way of life, especially in the world of business, that it’s hard to imagine not being able to easily get a physical copy of any document or image that you need. Before the computer printer was invented and popularised though, that was exactly the case. In fact, printers were so rare and specialist that, up until the 20th century, the word ‘printer’ referred to the person operating the machine, rather than the printing machine itself. So how exactly did the printer get to be where it is? Long before computers, the internet, or even electricity, there is evidence of different forms of printers being used. In 3500BC Mesopotamia, round cylinder seals with engraved designs were rolled across wet clay to transfer impressions of images or writing. Other early civilisations used stamps to print seals onto clay tablets as a form of signature or official endorsement. Thousands of years later and paper was widely used in Ancient China as a writing or printing material, after an official named Cai Lun was credited with the standardisation of the paper-making process in the early second century. The invention of paper revolutionised printing and began the use of wooden blocks carved with pictures or words and covered in ink to transfer copies onto paper. Although impractical and time-consuming, within a few centuries, this technique had spread around other East Asian countries, and by the 12th century, all the way to the west. We can date the first European woodcut print to the beginning of the 15th century in Germany. Images were carved into the surface of a block of wood, with the raised parts of the wooden block making an imprint on the surface of paper after being dipped in ink. It was soon realised that these blocks could be made for different letters and arranged in sentence order to create a reusable alphabet printing device. This led to an explosion in printed books, reportedly from 30,000 to 12 million in 50 years. Fast forward to 1938, when xerography was invented. This technique used dry powdered ink that was attracted to a statically charged drum to print items using a much smaller and more manageable machine. Over the next few decades, commercial xerographic copiers were introduced to offices, but they still weren’t used domestically. In the late 1960s, a Xerox printer was developed which holds its place in history as the first laser printer. By the mid-1970s, IBM had released the first commercially available laser printer, called the IBM 3800, which introduced fast high-volume printing with speeds of up to 215 pages per minute. They were very expensive, and extremely large. The technology was new, and it still had a long way to go before it would provide the effortless convenience of a modern printer. When printers did become widely available, the convenience of printing digital documents was quickly realised, and several digital printers came onto the market. The Indigo E-Print 100 was one of the first in 1993 and was roughly 10 times the size of the desktop computers of the day. 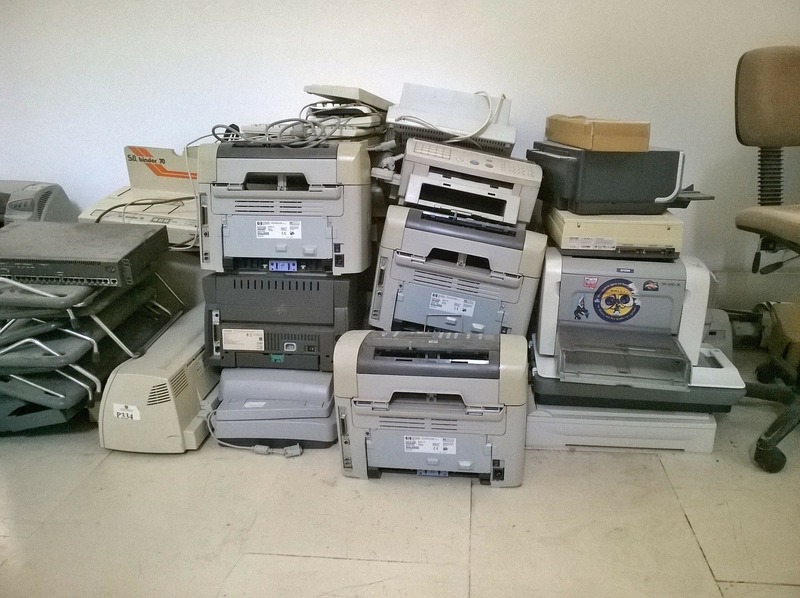 The price of laser and inkjet printers came down to a reasonable level in the 1990s and were soon viable for domestic use. Ever since then, the technology has become cheaper to replicate, leading to mass domestic and commercial adoption. In 2018, home printing is as much a mainstay as home computers. Commercially, although the switch to digital platforms for most work meant a decline in the use of physical documents, printers are still hugely important for creating copies of contracts, HR documents, and much more. The emergence of portable printers also now means that digital photographs or documents can be printed on the go from laptops and mobile devices. The future of printing likely holds as many surprises as the past. Since domestic adoption, inkjet and regular laser printers have been the most popular choices amongst printers for the home or office, but LED printers are also on the rise, a variation on laser printing technology. These printers use smaller, less intricate mechanisms to print documents, meaning lower maintenance requirements and less energy use. 3D printers are also on the horizon for consumers, with endless possibilities for printing objects from digital files. Although the technology is still young, 3D printers will inevitably become more and more popular, and we can expect to see them begin to appear in homes and workplaces over the next few years.